Today we are finishing up that first mitten! YEAH! ... tomorrow you will learn how to add a coat string for younger children, if you wish! FINISHING: If you have not done so already, cut a 15" yarn tail. Thread your yarn tail onto a yarn needle. 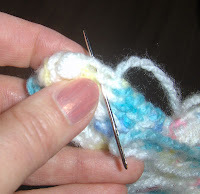 As you sew the tip of the thumb or top of the mittens, run the needle and yarn under the few top stitches across to the other side, pull slightly. This will gather the top a tiny bit. Continue sewing down the other side. Now this is where you can take a bristle hair brush and gently brush the inside of the mitt to make it slightly fluffy. Make another mitten the same. HUGS-- stay warm! and hug those teenagers wandering through your fridge! The great thing about these mittens is that you can make them any size you want. Just adjust the number of stitches for each part. Write them down if you need bigger. Could be you crochet much tighter than I do too. Maybe a larger hook? I really appreciate your sticking with me making these Renee'! Ok Im with you, I made it too small for Jacob but I went ahead and finished this one mitten. That's just right! Not sad at all!! LOVE IT! How about if you single crochet around and around the cuff for a few rows to make it longer? Next time you could also do like 10 sc for the cuff part. Easily adjustable. I love your blog. My brother and sister-in-law had a stillborn baby last January. To commemorate her birthday I thought about crocheting something to donate and I found your patterns and blog. I am really an amateur but I think I might be able to make a hat. I am grateful for the information you have provided and for the list of hospitals and centers to donate too. I sew better than I knit of crochet and was wondering if you know of places that accept baby quilts or other sewn items. Thanks. I'm happy you found my blog and website and want to use the things you find there to help others. UMC Vegas (the county) hospital is my hospital of choice near us-- Suzanne is great to work with. They can use baby quilts, any sewed items for a layette for newborns would be really welcomed! Also, here in Overton, there is Cappalappa-- they need baby diapers--cloth, sewed. Their info is on that page too.